SYNOPSIS: The Red Dwarf crew stumble upon Trojan, a derelict ship, which they commandeer when Rimmer receives a distress call from a ship captained by his antagonistic brother, Howard. The news of the return of cult British TV sci-fi sitcom 'Red Dwarf' was met with cautious optimism, after 2009's mixed three-part mini-series, 'Back To Earth'. Despite being the second most watched programme in the history of TV channel Dave, we were a little let down by a weary and overplayed 'Trojan'. Some SPOILERS AHEAD, avert your smegging gaze - if necessary. 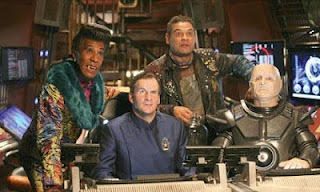 Lister (Craig Charles), Kryten (Robert Llewelyn), Rimmer (Chris Barrie), and The Cat (Danny John-Jules) are all back in the new series - the main omission being ship computer Holly, who may or may not still return. That might be the spark needed to right this wavering ship - 'Trojan' was full of weak jokes, overplayed satire and a disappointing lack of charm. The sibling relationship isn't the only aspect that seems forced, with the evil robot plot effectively shoe-horned into the story. Howard's sacrifice is something of a waste, only serving as the setup to a punchline for Arnold's continued quest to one-up his peers - business as usual then, rather than a suitably meaningful resolution. As a sitcom, one of 'Red Dwarf''s primary goals is to provide humour. I did laugh out loud. Once. When the Swedish moose joke reached its crescendo - sadly, the same cannot be said for the awful shopping channel satire, or the bland pig-racing and moustache jokes. The actors did the best they could with the relatively shoddy script, and despite their increasing years, at least the crew still look the part. With 'Doctor Who' disappearing off our screens for a short while, I had hoped that 'Red Dwarf' would rather fill the gap for endearing, comedic, adventurous small screen sci-fi. Perhaps not. But I shan't be too hasty, one lacklustre episode does not a series make. "Sometimes You Have To Lose Before You're Ready To Win". 'Red Dwarf X' airs every Thursday at 9pm, on Dave.